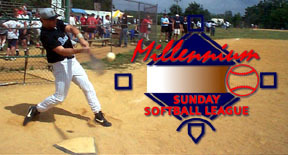 Millennium Softball Message Board: Re: Millennium Sunday - No medical runners are allowed ! Re: Millennium Sunday - No medical runners are allowed ! Posted by Joe O on 7/27/2018, 10:30 pm, in reply to "Re: Millennium Sunday - No medical runners are allowed !" If an umpire asks before the game starts - if our league allows a medical runner it is the responsibility of the teams (coaches) to make it clear to the umpire the use of a medical runner in Millennium Sunday is not allowed. And even if the umpire suggests that if both teams agree a medical runner can be used - he must be told no matter what that medical runners are not allowed. Once again - not sure anything more than that is needed to be said.